Sydney FC v Central Coast Mariners was billed as Graham Arnold v Phil Moss – predecessor v successor, and somewhat controversially by the official A-League account, after Sydney’s 2-0 win, master v apprentice. That may have been true for the vast majority of Moss’s games as head coach of the Mariners, where he’s largely stuck to the 4-2-3-1 formation and structured, organised style of play originally introduced by Arnold, but in this particular fixture, Moss switched to a system that Arnold never used. It was a return to the 5-4-1 of the 2013-14 Finals Series, where Moss drastically decided to switch from the Arnold template to a more pragmatic style – asking the side to sit very deep, playing Nick Montgomery in a hybrid role as a dual holding midfielder/centre-back, and relying on quick counter-attacks through the pacy wingers Bernie Ibini and Nick Fitzgerald. It worked fantastically in a 2-0 win over Brisbane just before the Finals Series, the first time the Mariners used this formation. The centre-backs, having the extra cover of Montgomery between them, were able to pressure Brisbane’s forwards from behind and prevent them from having any time and space in the final third. Furthermore, the positioning of the defensive block deep inside their own half encouraged Brisbane’s full-backs forward, and the Mariners were able to expose those with quick breaks. However, the nature of the victory suggested the approach wasn’t sustainable – they were unusually clinical, and there was a huge onus on the wingers being able to transition defence into attack over a distance of 40-50 metres. Furthermore, against a side that kept their full-backs ‘at home’, that space to break into wasn’t available, which explains why although the Mariners went on to defeat Adelaide (who pushed their full-backs high up) 1-0 in the preliminary final, the limitations of the new formation were obvious in a 2-0 semi-final defeat to the Western Sydney Wanderers (who kept their full-backs deep). Pre-season suggested Moss had recognised the limitations of the 5-4-1, as he predominantly used his 4-2-3-1 shape, and has kept with that shape for their two A-League games this season, against Newcastle Jets and Wellington Phoenix, as well as in the FFA Cup against Palm Beach Sharks. Yet here, with the benefit of two weeks off (as their match against the Western Sydney Wanderers was postponed due to the latter’s Asian Champions League commitments), Moss decided to return to a 5-4-1 against his former boss. This wasn’t the 5-4-1 of April 2014, though, but a slightly more proactive variant. It relied on integrated, cohesive movement of players between positions according to whether the side was attacking or defending. It’s reminiscent of Adelaide’s 3-4-3 – with one appropriate notation for possession, and another for the periods without possession. Without the ball, here, the formation was a 5-4-1/4-1-4-1, with John Hutchinson the keystone player. He was, generally speaking, playing a man-marking role on Alex Brosque, sitting between the lines and close to the Sydney #10 – but sometimes also dropping in between the centre-backs. Ahead of him was Glen Trifiro and Anthony Caceres, playing as the central midfield duo in a line of four, while Mitch Duke and Matt Sim were left and right wingers respectively, and Malick Mane alone upfront. 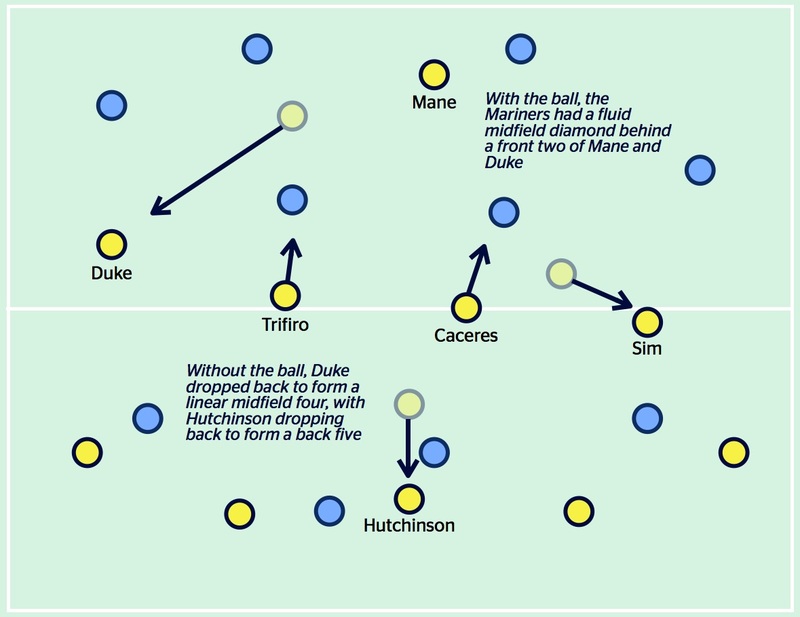 When the ball was won, Hutchinson moved forward to the base of a midfield diamond. This was very fluid, with the players rotating throughout, but in general Caceres played through the middle as a deep-lying #10, with Trifiro working the left and Sim playing very narrow as a right-sided shuttler. Duke moved from the left of a midfield four into a centre-forward position alongside Mane. Sounds complicated? It was. It required a significant amount of integrated movement in the periods of transition between winning and losing the ball, and tellingly, there were major issues in both the attacking and defensive phases. First, it’s important to note that Sydney FC were playing their usual 4-2-3-1, with Brosque in behind Marc Janko, Milos Dimitrijevic and Terry Antonis deep in midfield and Ali Abbas and Sebastian Ryall at full-back. That central midfield pairing was the key. Arnold has instructed both of them to sit very deep and collect possession off the back four in positions towards the channels, before moving forward on the ball and transitioning moves into the final third. It’s through those two that Sydney’s attacking play is funnelled – as a pair of clever, technical players both with a wide range of passing, they’re perfect for the role. It also meant that the Mariners midfield pairing of Trifiro and Caceres were keen to push high up and press up on Antonis and Dimitrijevic. That often meant, unusually, that the wingers in the Mariners midfield four were often deeper than the central players, as highlighted below. However, the pressing on Sydney’s central midfielders wasn’t particularly intense, so Antonis and Dimitrijevic were constantly free to move forward on the ball under little pressure. They finished with a substantial amount of passes each, with Antonis the game’s most prolific passer with 65 (Dimitrijevic attempted 61). 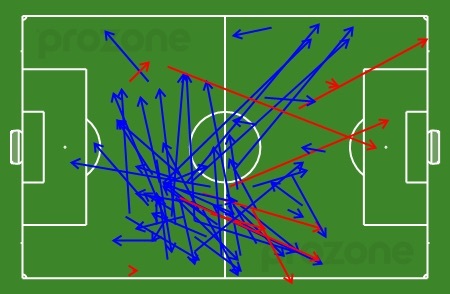 From this, Sydney were able to comfortably control the tempo of the match and work the ball forward into dangerous positions, often targeting the flanks. The fact that Antonis and Dimitrijevic were sitting deep in midfield, holding their position in front of the back four and creating something of a ‘defensive square’ with the centre-backs, encouraged the full-backs to push high up the pitch. In the context of the formation battle, this caused real problems for the Mariners, especially as both Ryall and Abbas pushed beyond Duke and Sim, who seemed uncomfortable tracking them into very deep positions. As Sydney’s wingers, Ibini and Gameiro, tucked in narrow, thus occupying the Mariners centre-backs (Bosnar and Poscilero), they created 1v1 situations out wide for the Sydney full-backs up against the Mariners full-backs. Ali Abbas, in particular, was prolific getting forward, swinging in a number of dangerous crosses from the left. On the opposite side, too, Ryall created chances – including a header for Janko in the 16th minute that the Austrian headed just wide. These chances can be viewed in the clip below. Sometimes, too, Gameiro and Ibini stayed wide and created their own 1v1s against Roux and Rose respectively. Overall, Sydney had the better of the Mariners in these situations, and were able to consistently create chances and increase the pressure on the Mariners. Another problem that the pressing of Caceres and Trifiro caused was that it opened up space between the lines of midfield and defence. This was particularly obvious when Hutchinson let Brosque run free and dropped between the centre-backs – the Sydney #10 was able to drift between the lines and sometimes find space to link play. When Hutchinson stuck tight to Brosque, and thus positioned himself as a holding midfielder rather than centre-back, the Mariners didn’t feel as open. Sydney’s two goals came from set-pieces, both from shots outside the box after an initial clearance, but they were befitting of Sydney’s dominance. When in possession, the Mariners 5-4-1 turned into a 4-4-2 diamond, however, a major issue was simply in the disjointed transition between these two shapes. Furthermore, immediately after winning the ball, they often looked to retain possession with safe passes so that the attackers could move into their ‘new’ positions, and this seemed to slow their attacking play and nullified the threat of any potential counter-attacks. This problem was accentuated by the lack of ‘explosive’ players like Fitzgerald, who can carry the ball forward at counter-attacks. Instead, the side was packed with technical, ball-playing midfielders and two strikers playing high up the pitch, and this seemed counter-intuitive to a coach like Moss who likes to play on the break. Where they did look promising was when the four central midfielders – Hutchinson, Caceres, Trifiro and Sim – created a numerical advantage in midfield, by playing around Sydney’s midfield duo of Antonis and Dimitrijevic . However, the opportunities to do this were limited by the fact Sydney pressed excellently up against the Mariners back four, with the wide players doing a particularly good job of cutting off passes towards the flanks. It was similar to the way Sydney closed down Brisbane Roar last week, and again demonstrated a new capacity under their new coach to effectively shut down opposition attacks high up the pitch. In the second half, Sydney sat deeper in two defined banks of four. This meant the Mariners built up possession more easily, and had a few chances to get back in the game. 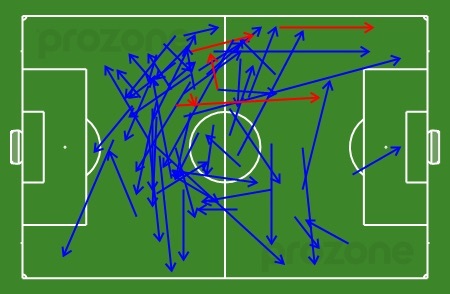 Furthermore, the switch of Duke and Mane at half-time meant the Mariners had a more effective outlet for counter-attacks on the left, and he had a few powerful runs (in contrary to Duke in the first half). While this was a fascinating formation, with two distinctly different shape according to whether the Mariners did/did not have possession, in short, the system backfired against Sydney FC. 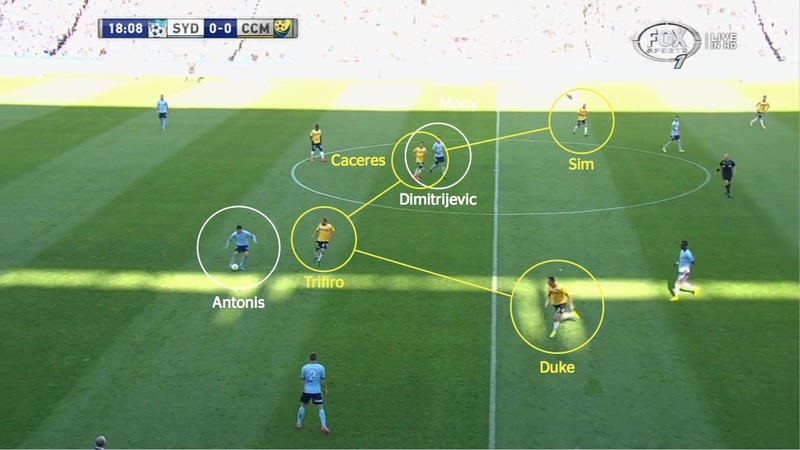 The major issue was Caceres and Trifiro being drawn towards Antonis and Dimitrijevic without actually putting them under significant pressure, meant they were not stopping Sydney’s major source of build-up play, and also vacating space behind them for Brosque to exploit. Sydney’s superiority in 1v1 situations out wide ensured they dominated the first hour of the game and deserved their 2-0 lead. The system wasn’t so bad that it will be scrapped altogether, but it’s clear it requires tweaking to find the right balance. From a purely neutral point of view, it’s the latest in a series of fascinating formations in the A-League this season, and it’s encouraging to see coaches being so varied and adaptable in their systems of play.